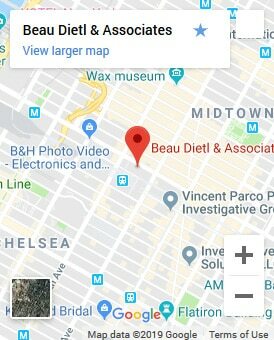 Premier security and investigations firm, Beau Dietl & Associates, launched a new investigative platform and solution to better protect victims of discrimination, sexual harassment, assault, and ethics violations in the workplace. The platform will be a confidential and independently administered web-portal, providing a secure avenue for employees to report workplace misconduct anonymously. Over the past year, the “MeToo” Movement has helped demonstrate the prevalence of sexual harassment and assault in the workplace, however, victims continue to face fear of retribution from employers when reporting a crime. The platform will allow for employers to have the opportunity to proactively support their employees and find the truth behind a claim without being directly involved in the investigation. It was created to combat misinformation while also providing HR departments a safe, transparent way to ensure due diligence is carefully administered. The platform is championed by Beau Dietl & Associate’s Vice President of Corporate Investigations, Charles Diamond. As a former senior investigator with the Equal Employment Opportunity Commission (EEOC), a federal agency that administers and enforces civil rights laws against workplace discrimination, Diamond has overseen thousands of workplace complaints and their subsequent investigations.